In New York, The funeral for Police Officer Rafael Ramos was attended by hundreds of police officers outside the Queens, N.Y. church. 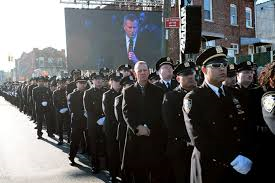 Saturday during the funeral multiple officers turned their backs on Mayor Bill de Blasio as he eulogized the fallen officer who was ambushed last week along with his partner. Police union officials blame de Blasio for comments he made about the police amid protests over the deaths of Brown and Garner. The police union’s president, Patrick Lynch, and others turned their backs on the mayor in a sign of disrespect. When De Blasio’s remarks were being shown on large TV monitors outside the Christ Tabernacle Church. Police union officials accused the mayor of fostering a climate of mistrust that contributed to the killings of Officer Ramos and his partner. Vice President Joe Biden spoke and expressed condolences directly to Ramos’ two sons. The NYPD’s stop-and-frisk practices had long raised serious concerns over racial profiling, illegal stops and privacy rights. The Department’s own report on its stop-and-frisk activity confirm what many people in communities of color across the city have long known: The police are/have been stopping hundreds of thousands of law-abiding New Yorkers every year, and the vast majority are black and Latino. An analysis by the NYCLU revealed that innocent New Yorkers have been subjected to police stops and street interrogations more than 4 million times since 2002, and that black and Latino communities continue to be the overwhelming target of these tactics. It was wrong for police unions and their support groups to say that Eric Garner was overweight at 350-400 pounds and battling asthma, many posters on the sites TheeRant and PoliceOne.com said the Staten Island father and husband brought his death last Thursday upon himself. They said his health contributed to his cardiac arrest, and that their interpretation of an eyewitness video of Garner’s altercation with police last Thursday was that he resisted arrest. It is wrong for Police to protest at a funeral, period! Take your protest elsewhere! As far as the Chickens coming to Roost for New York, Mayor de Blasio, who campaigned on a promise to “end the era of stop-and-frisk policing,” moved slowly to do that. He (de Blasio) announced a deal to drop the city’s appeal of a court ruling that found the NYPD’s use of stop-and-frisk violated the constitutional rights of minorities. Mostly it seems that, the questionable “Stop and Frisk,” police policy is still on the forefront of their agenda, and has not stopped. In addition-adding to the confusion by fighting against the Mayor, who is the head of their community is a total misuse of their time. More importantly the fact of the matter it shows that our Police who are trained sworn public servants may not care about the hurt families, divided communities and the large number of citizens who have withdrawn their support and they have expressed disappointment with the perceived mishandling the Police Brutality situation. 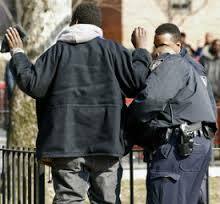 This erosion of the public trust between Police and the community, will need to be resolved. 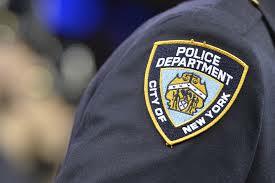 This entry was posted in Civil Rights, Gregg Greer, greggrreer, NYPD, NYPD, NYPD Scandals, NYPD Scandals, One World, oneworld, oneworld01, Police Kill, SCLC, Uncategorized and tagged Bill de Blasio, Mayor de Blasio, New York, police officers, Police union, Rafael Ramos. In the New Year 2015-We Pray for All who have Marched, Stood, and Stand ” for Justice and World Peace!